The Conservative Party was founded in 1834 from the Tory Party—the Conservatives' colloquial name is "Tories"—and was one of two dominant political parties in the nineteenth century, along with the Liberal Party. Under Benjamin Disraeli it played a preeminent role in politics at the height of the British Empire. In 1912, the Liberal Unionist Party merged with the party to form the Conservative and Unionist Party. In the 1920s, the Labour Party surpassed the Liberals as the Conservatives' main rivals. Conservative Prime Ministers — notably Winston Churchill and Margaret Thatcher — led governments for 57 years of the twentieth century. The Conservative Party was founded in the 1830s. However, some writers trace its origins to the reign of Charles II in the 1670s Exclusion Crisis. Other historians point to a faction, rooted in the 18th century Whig Party, that coalesced around William Pitt the Younger in the 1780s. They were known as "Independent Whigs", "Friends of Mr Pitt", or "Pittites" and never used terms such as "Tory" or "Conservative". Pitt died in 1806. From about 1812 on the name "Tory" was commonly used for a new party that, according to historian Robert Blake, "are the ancestors of Conservatism". Blake adds that Pitt's successors after 1812 "were not in any sense standard-bearer's of true Toryism". The term "Conservative" was suggested as a title for the party by a magazine article by J. Wilson Croker in the Quarterly Review in 1830. The name immediately caught on and was officially adopted under the aegis of Sir Robert Peel around 1834. Peel is acknowledged as the founder of the Conservative Party, which he created with the announcement of the Tamworth Manifesto. The term "Conservative Party" rather than Tory was the dominant usage by 1845. The widening of the electoral franchise in the nineteenth century forced the Conservative Party to popularise its approach under Edward Smith-Stanley, 14th Earl of Derby and Benjamin Disraeli, who carried through their own expansion of the franchise with the Reform Act of 1867. In 1886, the party formed an alliance with Spencer Compton Cavendish, Lord Hartington (later the 8th Duke of Devonshire) and Joseph Chamberlain's new Liberal Unionist Party and, under the statesmen Robert Gascoyne-Cecil, Lord Salisbury and Arthur Balfour, held power for all but three of the following twenty years before suffering a heavy defeat in 1906 when it split over the issue of free trade. Two weeks later, Churchill crossed the floor and formally joined the Liberal Party. )He rejoined the Conservatives in 1925.) In December, Balfour lost control of his party, as the defections multiplied. He was replaced by Liberal Prime Minister Henry Campbell-Bannerman who called an election in January 1906, which produced a massive Liberal victory with a gain of 214 seats. Liberal Prime Minister H. H. Asquith enacted a great deal of reform legislation, but the Unionists worked hard at grassroots organizing. Two general elections were held in 1910, one in January and one in December. The two main parties were now almost dead equal in seats. The Unionists had more popular votes but the Liberals kept control with a coalition with the Irish Parliamentary Party. In 1912, the Liberal Unionists merged with the Conservative Party. In Ireland, the Irish Unionist Alliance had been formed in 1891 which merged Unionists who were opposed to Irish Home Rule into one political movement. Its MPs took the Conservative whip at Westminster, and in essence, formed the Irish wing of the party until 1922. In Britain, the Conservative party was known as the Unionist Party because of its opposition to home rule in Ireland. Under Andrew Bonar Law's leadership in 1911-14, the Party morale improved, the "radical right" wing was contained, and the party machinery strengthened. It made some progress toward developing constructive social policies. Historian Jeremy Smith says Bonar Law was pushing hard—certainly blustering and threatening, and perhaps bluffing—but in the end his strategy proved both coherent and effective. While the Liberals were mostly against the war until the invasion of Belgium, Conservative leaders were strongly in favour of aiding France and stopping Germany. The Liberal party was in full control of the government until its mismanagement of the war effort under the Shell Crisis badly hurt its reputation. An all-party coalition government was formed in May 1915. In late 1916 Liberal David Lloyd George became prime minister but the Liberals soon split and the Conservatives dominated the government, especially after their landslide in the 1918 election. The Liberal party never recovered, but Labour gained strength after 1920. Nigel Keohane finds that the Conservatives were bitterly divided before 1914, especially on the issue of Irish Unionism and the experience of three consecutive election losses. However the war pulled the party together, allowing it to emphasise patriotism as it found new leadership and worked out its positions on the Irish question, socialism, electoral reform, and the issue of intervention in the economy. The fresh emphasis on anti-Socialism was its response to the growing strength of the Labour Party. When electoral reform was an issue, it worked to protect their base in rural England. It aggressively sought female voters in the 1920s, often relying on patriotic themes. In 1922, Bonar Law and Stanley Baldwin led the break-up of the coalition and the Conservatives governed until 1923, when a minority Labour government led by Ramsay MacDonald came to power. The Conservatives regained power in 1924 and remained in power for the full five-year term. They were defeated in 1929 as a minority Labour government, again led by MacDonald; took office. In 1931, following the collapse of the Labour minority government, it entered another coalition, which was dominated by the Conservatives with some support from factions of both the Liberal and Labour Parties (National Labour and National Liberals). 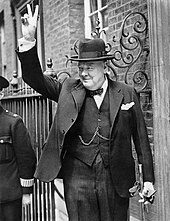 In May 1940, a more balanced coalition was formed, the National Government, which, under the leadership of Winston Churchill, saw the United Kingdom through World War II. However, the party lost the 1945 general election in a landslide to the resurgent Labour Party, who won their first ever majority government. The concept of the "property-owning democracy" was coined by Noel Skelton in 1923 and became a core principle of the party. While serving in Opposition during the late-1940s, the Conservative Party exploited and incited growing public anger at food rationing, scarcity, controls, austerity, and omnipresent government bureaucracy. It used the dissatisfaction with the socialist and egalitarian policies of the Labour Party to rally middle-class supporters and build a political comeback that won them the 1951 general election. Their appeal was especially effective to housewives, who faced more difficult shopping conditions after the war than during the war. In 1947, the party published its Industrial Charter which marked its acceptance of the "post-war consensus" on the mixed economy and labour rights. David Maxwell Fyfe chaired a committee into Conservative Party organisation that resulted in the Maxwell Fyfe Report (1948–49). The report shifted the balance of electoral funding from the candidate to the party, with the intention of broadening the diversity of MPs. In practice, it may have had the effect of lending more power to constituency parties and making candidates more uniform. The success of the Conservative Party in reorganising itself was validated by its victory at the 1951 general election. Winston Churchill, the party leader, brought in a Party Chairman to modernise the creaking institution. Frederick Marquis, 1st Earl of Woolton was a successful department store owner and wartime Minister of Food. As Party Chairman 1946–55, he rebuilt the local organisations with an emphasis on membership, money, and a unified national propaganda appeal on critical issues. To broaden the base of potential candidates, the national party provided financial aid to candidates, and assisted the local organisations in raising local money. Woolton emphasised a rhetoric that characterised the opponents as "Socialist" rather than "Labour". The libertarian influence of Professor Friedrich Hayek's 1944 best-seller Road to Serfdom was apparent in the younger generation, but that took another quarter century to have a policy impact. By 1951, Labour had worn out its welcome in the middle classes; its factions were bitterly embroiled. Conservatives were ready to govern again. With a narrow victory at the 1951 general election, despite losing the popular vote, Churchill was back in power. Although he was ageing rapidly, he had national and global prestige. Apart from rationing, which was ended in 1954, most of the welfare state enacted by Labour were accepted by the Conservatives and became part of the "post-war consensus" that would later be satirised as Butskellism, and which lasted until the 1970s. The Conservatives were conciliatory towards unions, but they did privatise the steel and road haulage industries in 1953. During the Conservatives' thirteen-year tenure in office, pensions went up by 49% in real terms, sickness and unemployment benefits by 76% in real terms, and supplementary benefits by 46% in real terms. However, family allowances fell by 15% in real terms during that period. The Conservatives were re-elected in 1955 and 1959 with larger majorities. Conservative Prime Ministers Churchill, Sir Anthony Eden, Harold Macmillan and Sir Alec Douglas-Home promoted relatively liberal trade regulations and less state involvement throughout the 1950s and early-1960s. The Suez Crisis of 1956 was a humiliating defeat for Prime Minister Eden, but his successor, Macmillan, minimised the damage and focused attention on domestic issues and prosperity. Macmillan boasted during the 1959 general election that Britain had "never had it so good". In 1958, Geoffrey Howe co-authored the report A Giant's Strength published by the Inns of Court Conservative Association. The report argued that the unions had become too powerful and that their legal privileges ought to be curtailed. Iain Macleod discouraged the authors from publicising the report. Macmillan believed that trade union votes had contributed towards the 1951 and 1955 victories and thought that it "would be inexpedient to adopt any policy involving legislation which would alienate this support". Macmillan's bid to join the European Economic Community (EEC) in early-1963 was blocked by French President Charles de Gaulle. The period saw the decline of the United Kingdom as a prominent world leader, with the loss of practically the entire Empire and a laggard economy. Following controversy over the selections of Harold Macmillan and Sir Alec Douglas-Home via a process of consultation known as the 'Magic Circle', a formal election process was created and the first leadership election was held in 1965. Of the three candidates, Edward Heath won with 150 votes to Reginald Maudling's 133 and Enoch Powell's 15 votes. Edward Heath's 1970–74 government was known for taking the UK into the EEC, although the right-wing of the party objected to his failure to control the trade unions at a time when a declining British industry saw many strikes, as well as a recession which started in 1973 and lasted for two years. Since accession to the EEC, which developed into the EU, British membership has been a source of heated debate within the Conservative Party. Heath had come to power in June 1970 and the last possible date for the next general election was not until mid-1975. However a general election was held in February 1974 in a bid to win public support during a national emergency caused by the miners' strike. However, Heath's attempt to win a second term in power at this "snap" election failed, as a deadlock result left no party with an overall majority. The Conservatives had more votes than Labour; but Labour had four more seats. Heath resigned within days, after failing to gain Liberal Party support in order to form a coalition government, paving the way for Harold Wilson and Labour to return to power as a minority government. Heath's hopes of returning to power later in the year were ended when Labour won the October 1974 election with an overall majority of three seats. Loss of power weakened Heath's control over the party and Margaret Thatcher deposed him in the 1975 leadership election. The UK in the 1970s had seen sustained high inflation rates, which were above 20% at the time of the leadership election, subsequently falling to below 10%; unemployment had risen, and over the winter of 1978–79 there was a series of strikes known as the "Winter of Discontent". Thatcher led her party to victory at the 1979 general election with a manifesto which concentrated on the party's philosophy rather than presenting a "shopping list" of policies. As Prime Minister, Thatcher focused on rejecting the mild liberalism of the post-war consensus that tolerated or encouraged nationalisation, strong labour unions, heavy regulation, high taxes, and a generous welfare state. She did not challenge the National Health Service, and supported the Cold War policies of the consensus, but otherwise tried to dismantle and delegitimise it. To replace the old post-war consensus, she built a right-wing political ideology that became known as Thatcherism, based on social and economic ideas from British and American intellectuals such as Friedrich Hayek and Milton Friedman. Thatcher believed that too much socially democratic-oriented government policy was leading to a long-term decline in the British economy. As a result, her government pursued a programme of economic liberalism, adopting a free-market approach to public services based on the sale of publicly owned industries and utilities, as well as a reduction in trade union power. She held the belief that the existing trend of unions was bringing economic progress to a standstill by enforcing "wildcat" strikes, keeping wages artificially high and forcing unprofitable industries to stay open. 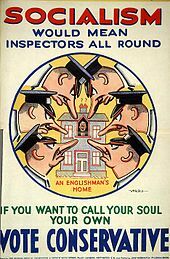 One of Thatcher's largest and most successful policies assisted council house tenants in public housing to purchase their homes at favourable rates. The "Right to Buy" had emerged in the late-1940s but was too great a challenge to the Post-War Consensus to win Conservative endorsement. Thatcher from her earliest days in politics favoured the idea because it would lead to a "property-owning democracy", an important idea that had emerged in the 1920s. Some local Conservative-run councils enacted profitable local sales schemes during the late-1960s. By the 1970s, many working-class people had ample incomes to afford to buy homes, and eagerly adopted Thatcher's invitation to purchase their homes at a sizable discount. The new owners were more likely to vote Conservative, as Thatcher had hoped. Thatcher led the Conservatives to two further electoral victories with landslide[clarification needed] majorities in 1983 and 1987. She was greatly admired by her supporters for her leadership in the Falklands War of 1982—which coincided with a dramatic boost in her popularity—and for policies such as giving the right to council house tenants to buy their council house at a discount on market value. She was also deeply unpopular in certain sections of society due to high unemployment, which reached its highest level since the 1930s, peaking at over 3,000,000 people following her economic reforms, and her response to the miners' strike. Unemployment had doubled between 1979 and 1982, largely due to Thatcher's monetarist battle against inflation. At the time of the 1979 general election, inflation had been at 9% or under for the previous year, having decreased under Callaghan, then increased to over 20% in the first two years of the Thatcher ministry, but it had fallen again to 5.8% by the start of 1983 (it continued to be under 7% until 1990). The British economy benefitted in the first Thatcher ministry by tax income from North Sea oil coming on stream. The period of unpopularity of the Conservatives in the early-1980s coincided with a crisis in the Labour Party which then formed the main opposition. The Social Democratic Party (SDP) was established in 1981 and consisted of more than twenty breakaway Labour MPs, who quickly formed the SDP-Liberal Alliance with the Liberal Party. By the turn of 1982, the SDP-Liberal Alliance was ahead of the Conservatives in the opinion polls, but victory in the Falklands War in June that year, along with the recovering British economy, saw the Conservatives returning quickly to the top of the opinion polls and winning the 1983 general election with a landslide majority, due to a split opposition vote. Thatcher now faced, arguably, her most serious rival yet after the 1983 general election, when Michael Foot resigned as Leader of the Labour Party and was succeeded by Neil Kinnock. With a new leader at the helm, Labour were clearly determined to defeat the Conservatives at the next election and for virtually the entirety of Thatcher's second ministry it was looking a very serious possibility, as the lead in the opinion polls constantly saw a change in leadership from the Conservatives to Labour, with the Alliance occasionally scraping into first place. By the time of the general election in June 1987, the economy was stronger, with lower inflation and falling unemployment and Thatcher secured her third successive electoral victory with a second, albeit reduced, landslide majority. The introduction of the Community Charge (known by its opponents as the poll tax) in 1989 is often cited as contributing to her political downfall. The summer of 1989 saw her fall behind Neil Kinnock's Labour in the opinion polls for the first time since 1986, and her party's fall in popularity continued into 1990. By the second half of that year, opinion polls were showing that Labour had a lead of up to 16 points over the Conservatives and they faced a tough 18 months ahead of them if they were to prevent Kinnock's ambition to become Prime Minister from becoming a reality. At the same time, the economy was sliding into another recession. Internal party tensions led to a leadership challenge by the Conservative MP Michael Heseltine; and, after months of speculation about her future as Prime Minister, she resigned on 28 November 1990, making way for a new Conservative leader more likely to win the next general election in the interests of party unity. John Major won the party leadership election on 27 November 1990, and his appointment led to an almost immediate boost in Conservative Party fortunes. A MORI poll six days before Mrs Thatcher's resignation had shown the Conservatives to be 11 points behind Labour, but within two months the Conservatives had returned to the top of the opinion polls with a narrow lead. A general election had to be held within the next eighteen months and the UK economy was sliding into recession, but 1991 was a year of electoral uncertainty as the Conservatives and Labour regularly swapped places at the top of the opinion polls, and Major resisted Neil Kinnock's numerous calls for an immediate election. The election was finally held on 9 April 1992 and the Conservatives won a fourth successive electoral victory, even though the economy was still in recession and most of the polls had predicted either a narrow Labour victory or a hung parliament. Major's vigorous campaigning, notably his claim that the UK would have higher prices and higher taxes under a Labour government, was seen to have been crucial in his election win (in which he became the first—and as of 2015, only—Prime Minister to attract 14,000,000 votes in a general election), as was a high-profile campaign by The Sun newspaper against Labour leader Neil Kinnock, who resigned in the aftermath of the election to be succeeded by John Smith. The Conservative Party also touched upon the issue of immigration, claiming that under Labour, immigration would rise hugely. The UK economy was deep in recession by this stage and remained so until the end of the year. The pound sterling was forced out of the European Exchange Rate Mechanism on 16 September 1992, a day thereafter referred to as Black Wednesday. Soon after, approximately one million householders faced repossession of their homes during a recession that saw a sharp rise in unemployment, taking it close to 3,000,000 people. The party subsequently lost much of its reputation for good financial stewardship although the end of the recession was declared in April 1993 bringing economic recovery and a fall in unemployment. From 1994–1997, Major privatised British Rail, splitting it up into franchises to be run by the private sector. Its success is hotly debated, with a large increase in passenger numbers and investment in the network balanced by worries about the level of subsidy. Train fares cost more than under British Rail. The party was plagued by internal division and infighting, mainly over the UK's role in the European Union. The party's Eurosceptic wing, represented by MPs such as John Redwood, opposed further EU integration, whilst the party's pro-European wing, represented by those such as Chancellor of the Exchequer Kenneth Clarke, was broadly supportive. The issue of the creation of a single European currency also inflamed tensions, and these would continue to dog the party until the early-2000s (decade). These divisions gave off an impression of a divided party, which had lost touch with the voters. Major also had to survive a leadership challenge in 1995 by the Secretary of State for Wales, the aforementioned John Redwood. Major survived, but Redwood received 89 votes from MPs, as well as the backing of the Sun newspaper, which described the choice as being between "Redwood or Deadwood". This further undermined Major's influence in the Conservative Party. The Conservative government was also increasingly accused in the media of "sleaze". Their support reached its lowest ebb in late 1994, after the sudden death of Labour Party leader John Smith and the election of Tony Blair as his successor, when Labour had up to 60% of the vote in opinion polls and had a lead of some 30 points ahead of the Conservatives. The Labour lead was gradually narrowed over the next two years, as the Conservatives gained some credit for the strong economic recovery and fall in unemployment. But as the 1997 general election loomed, despite their high-profile New Labour, New Danger campaign, it was still looking certain that Labour would win. An effective opposition campaign by the Labour Party culminated in a landslide defeat for the Conservatives in 1997 that was Labour's largest ever parliamentary victory, and the worst defeat for the Conservatives since the 1906 general election 91 years earlier. The 1997 general election left the Conservative Party as an England-only party, with all Scottish and Welsh seats having been lost, and not a single new seat having been gained anywhere. John Major resigned as party leader after the Conservatives were heavily defeated in a landslide and was succeeded by William Hague. Though Hague was a strong orator, a Gallup poll for The Daily Telegraph found that two-thirds of voters regarded him as "a bit of a wally", for headlines such as his claim that he drank 14 pints of beer in a single day in his youth. He was also criticised for attending the Notting Hill Carnival and for wearing a baseball cap in public in what were seen as poor attempts to appeal to younger voters. Shortly before the 2001 general election, Hague was much maligned for a speech in which he predicted that a re-elected Labour government would turn the UK into a "foreign land". The BBC also reported that the Conservative peer John Lord Taylor criticised Hague for not removing the whip from John Townend, a Conservative MP, after the latter made a speech in which he said the British were becoming "a mongrel race", although Hague did reject Townend's views. The 2001 general election resulted in a net gain of just one seat for the Conservative Party, just months after the fuel protests of September 2000 had seen the Conservatives briefly take a narrow lead over Labour in the opinion polls. Having privately set himself a target of 209 seats, matching Labour's performance in 1983—a target which he missed by 43—William Hague resigned soon after. Iain Duncan Smith (2001–2003) (often known as IDS or simply: "Duncan Smith" and by satirists as "the quiet man") is a strong Eurosceptic, but the issue did not define Duncan Smith's leadership, though during his tenure, Europe ceased to be an issue of division in the party as it united behind calls for a referendum on the proposed European Union Constitution. However, before he could lead the party into a general election, Duncan Smith lost the vote on a motion of no confidence by MPs who felt that the party would not be returned to government under his leadership. This was despite the Conservative support equalling that of Labour in the months leading up to his departure from the leadership. Michael Howard then stood for the leadership unopposed on 6 November 2003. Under Howard's leadership in the 2005 general election, the Conservative Party increased their total vote share by around 0.7% (up to 32.4%) and—more significantly—their number of parliamentary seats by 33 (up to 198 seats). This gain accompanied a large decline in the Labour vote, and the election reduced Labour's majority from 167 to 68 and its share of the vote to 35.2%. The campaign, based on the slogan "Are you thinking what we're thinking? ", was designed by Australian pollster Lynton Crosby. The day following the election, on 6 May, Howard announced that he did not feel it was right to continue as leader after defeat in the general election, also saying that he would be too old to lead the party into another campaign and would therefore step down after allowing time for the party to amend its leadership election rules. David Cameron won the 2005 leadership election. Cameron defeated his closest rival, David Davis, by a margin of more than two to one, taking 134,446 votes to 64,398. He then announced his intention to reform and realign the Conservatives, saying they needed to change the way they looked, felt, thought and behaved, advocating a more centre-right stance as opposed to their recent staunchly right-wing platform. 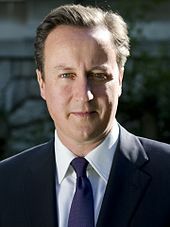 Although Cameron's views are probably to the left of the party membership and he sought to make the Conservative brand more attractive to young, socially liberal voters, he has also expressed his admiration for Margaret Thatcher, describing himself as a "big fan of Thatcher's", though he questions whether that makes him a "Thatcherite". For most of 2006 and the first half of 2007, polls showed leads over Labour for the Conservatives. Polls became more volatile in summer 2007 with the accession of Gordon Brown as Prime Minister, although polls gave the Conservatives a lead after October of that year and, by May 2008, with the UK's economy sliding into its first recession since 1992, and a week after local council elections, a YouGov poll commissioned by The Sun newspaper was published giving the Conservative Party a 26-point lead over Labour, its largest lead since 1968. The Conservatives gained control of the London mayoralty for the first time in May 2008 after Boris Johnson defeated the Labour incumbent, Ken Livingstone. The Conservative lead in the opinion polls had been almost unbroken for nearly three years when Britain finally went to the polls on 6 May 2010, though since the turn of 2010 most polls had shown the Conservative lead as less than 10 points wide. The election resulted in a hung parliament with the Conservatives having the most seats (306) but being twenty seats short of an overall majority. Following the resignation of Gordon Brown as Prime Minister and Leader of the Labour Party five days afterwards, David Cameron was named as the country's new Prime Minister and the Conservatives entered government in a coalition with the Liberal Democrats—the first post-war coalition government. In May 2014, the Conservatives were defeated in the European parliamentary elections coming in third place behind the UK Independence Party and Labour. UKIP ended with 24 MEPs, Labour 20, and the Conservatives 19. The result was described by UKIP leader Nigel Farage as "disastrous" for Cameron, and the leaders of the other main parties. In September 2014, the Unionist side, championed by Labour as well as by the Conservative Party and the Liberal Democrats, won in the Scottish Independence referendum by 55% No to 45% Yes on the question "Should Scotland be an independent country". This can be seen as a victory for British Unionism, a core part of traditional Conservative ideology, and also for David Cameron as the incumbent Prime Minister. At the 2015 general election, the Conservatives won a majority of seats in the House of Commons and formed a majority government under David Cameron. The party increased its national vote share, becoming the first incumbent party to do so since 1900. The result was unexpected and exceeded even the party leadership's expectations, as most polls had predicted a hung parliament. This was also the first general election since 1992 in which the Conservatives had won an overall majority, although the vote share of 36.9% was lower than the previous four Conservative majority governments under Thatcher and Major. In March 2017, the party was fined £70,000, the largest fine of this sort in British political history, after an Electoral Commission investigation found "significant failures" by the party to report its 2015 general election campaign spending. On the morning of Friday 24 June 2016, Cameron announced his intention to resign as Prime Minister, after he failed to convince the British public to stay in the European Union, and subsequently the Conservative Party leadership election was announced with Theresa May, Michael Gove, Stephen Crabb, Liam Fox and Andrea Leadsom confirmed as the official contenders to be his successor with Boris Johnson ruling himself out of the process. After Crabb withdrew, Fox and then Gove were eliminated in successive ballots by Conservative MPs, leaving Leadsom and May as the final candidates to be put before the wider Conservative Party membership. Leadsom subsequently withdrew from the contest on 11 July. On 11 July 2016, Theresa May became the leader of the Conservative Party with immediate effect following the withdrawal from the leadership election of her sole remaining opponent, Andrea Leadsom. She was appointed Prime Minister of the United Kingdom on 13 July 2016. She has promised social reform and a more centrist political outlook for the Conservative Party and its government. In a speech after her appointment, May emphasised the term Unionist in the name of the party, reminding all of "the precious, precious bond between England, Scotland, Wales and Northern Ireland". May considers herself a one nation conservative. May's early cabinet appointments were interpreted both as "centrist and conciliatory", an effort to reunite the party in the wake of the UK's vote to leave the European Union, and as "a shift to the right" according to The Guardian. May appointed former Mayor of London Boris Johnson as Foreign Secretary, former Secretary of State for Energy and Climate Change Amber Rudd as Home Secretary, and former Shadow Home Secretary David Davis to the newly created office of Brexit Secretary. Liam Fox and Philip Hammond, who had both previously served as Secretary of State for Defence (Fox from 2010 to 2011 and Hammond from 2011 to 2014), were appointed to the newly created office of International Trade Secretary and as Chancellor of the Exchequer respectively. Replacing Michael Gove, Elizabeth Truss was made Justice Secretary, the "first female Lord Chancellor in the thousand-year history of the role".Andrea Leadsom, who was energy minister and May's primary competitor for party leader, was made the new environment secretary. However, former Northern Ireland Secretary Theresa Villiers resigned from Cabinet after May offered her a post which was "not one which I felt I could take on". Nearly half of the first May ministry were women. In her first speech, May made a promise to combat the "burning injustice" in British society and create a union "between all of our citizens" and promising to be an advocate for the "ordinary working-class family" and not just for "privileged few" in the UK. In April 2017, the Cabinet agreed to hold a general election on 8 June. During the resulting campaign, Theresa May asked the electorate to "strengthen my hand" in Brexit negotiations, promised "strong and stable leadership in the national interest" and warned of a "coalition of chaos" under Jeremy Corbyn. Contrary to opinion polling at the time, the election resulted in a hung parliament, with the Conservative Party having 317 seats in the House of Commons, but without an overall majority. The Democratic Unionist Party suggested it would be able to provide a confidence and supply arrangement depending on negotiations. On 9 June 2017, May announced her intention to form a new minority government with support from the DUP, which was finalised on 26 June. On 8 January 2018, May announced her first major cabinet reshuffle, keeping in place most ministers, but promoting others. In February 2019, three Conservative MPs - Heidi Allen, Sarah Wollaston, and Anna Soubry - defected from the party to join The Independent Group, a pro-EU political association of MPs founded by seven former members of the Labour party. The MPs said the reasons for their departure were their opposition to the party's handling of Brexit, what they saw as the takeover of the Conservative party by 'right wing, ... hard-line anti-EU' MPs, and lack of concern from the Conservative party for the 'most vulnerable in society'. The Conservative Party believes that free markets and individual achievement are the primary factors behind economic prosperity. A leading economic theory advocated by Conservatives is supply side economics, this theory holds that reduced income tax rates increase GDP growth and thereby generate the same or more revenue for the government from the smaller tax on the extra growth. This belief is reflected, in part, by the advocacy of tax cuts. The party has recently focused on the social market economy in Britain, promoting a free market for competition with social balance to create fairness. This has included curbs on the banking sector, enterprise zones to revive regions in Britain and grand infrastructure projects such as high-speed rail. One concrete economic policy of recent years has been opposition to the European single currency. Anticipating the growing Euroscepticism within his party, John Major negotiated a British opt-out from the single currency in the 1992 Maastricht Treaty, although several members of Major's cabinet, such as Kenneth Clarke, were personally supportive of EMU participation. Following Major's resignation after the 1997 defeat, each of the four subsequent Conservative leaders, including David Cameron, have positioned the party firmly against the adoption of the euro. This policy is broadly popular with the British electorate. Following Labour's victory in the 1997 general election, the Conservative Party opposed Labour's decision to grant the Bank of England independent control of interest rates—on the grounds that it would be a prelude to the abolition of the pound sterling and acceptance of the European single currency, and also expressed concern over the removal of monetary policy from democratic control. However, Bank independence was popular amongst the financial community as it helped to keep inflation low. The Conservatives accepted Labour's policy in early 2000. Since coming to power, the 50% top rate of income tax has been dropped to 45% in 2013. Furthermore, the Conservative Party has reduced government spending. Since the election of David Cameron as party leader, the Conservative Party has distanced itself from association with social conservatism. Socially conservative policies such as tax incentives for married couples and the belief that benefits for those out of work should be reduced may have played a role in the party's electoral decline in the 1990s and early 2000s, and so the party has attempted to seek a new direction. The introduction of equal marriage rights for LGBT+ individuals in 2010 can be said to have represented a shift away from social conservatism, though the extent to which this policy truly represented a more 'liberal' Conservative party has been challenged. Since 1997, debate has occurred within the party between 'modernisers' such as Alan Duncan, who believe that the Conservatives should modify their public stances on social issues, and 'traditionalists' such as Liam Fox and Owen Paterson, who believe that the party should remain faithful to its traditional conservative platform. William Hague's and Michael Howard campaigned on traditionalist grounds in the 2001 and 2005 General Elections respectively, and 2001 also saw the election of traditionalist Iain Duncan Smith as party leader. In the current parliament, modernising forces are represented by MPs such as Neil O'Brien, who has argued that the party needs to renew its policies and image, and is said to be inspired by Macron's centrist politics. Ruth Davidson is also seen as a reforming figure, as is the backbench MP Kemi Badenoch. Many of the original 'traditionalists' remain influential, though Ian Duncan Smith's influence in terms of Commons contributions has waned. Many 'traditionalist' backbenchers such as Christopher Chope, Peter Bone and Jacob Rees-Mogg command significant media attention for their use of fillibustering and frequent interjections, and so remain influential forces in the Commons, though they cannot be taken to represent all 'traditionalist' Conservatives. The party has strongly criticised Labour's "state multiculturalism". Shadow Home Secretary Dominic Grieve said in 2008 that state multiculturalism policies had created a "terrible" legacy of "cultural despair" and dislocation, which has encouraged support for "extremists" on both sides of the debate. David Cameron responded to Grieve's comments by agreeing that policies of "state multiculturalism" that treat social groups as distinct, for example policies that "treat British Muslims as Muslims, rather than as British citizens", are wrong. However, he expressed support for the premise of multiculturalism on the whole, arguing that it was "absolutely right" to encourage society to integrate more "to build a strong British identity for the future". Official statistics showed that EU and non-EU mass immigration, together with asylum seeker applications, all increased substantially during Cameron's term in office. However, this was not solely as a result of intentional government policy - during this period, there were significant refugee flows into the UK and an increased level of asylum applications due to conflict and persecution in a number of other states. Some political and media discourses at the time suggested that this increase in immigration and reception of refugees and asylum seekers caused significant strain on other areas of social policy through overburdening the NHS and the welfare state - these discourses were influential, but have not been empirically or decisively proven to be true. Margaret Thatcher (second left), Ronald Reagan (far left) and their respective spouses in 1988. Thatcher and Reagan developed a close relationship against the Soviet Union. For much of the 20th century, the Conservative Party took a broadly Atlanticist stance in relations with the United States, favouring close ties with the United States and similarly aligned nations such as Canada, Australia and Japan. The Conservatives have generally favoured a diverse range of international alliances, ranging from the North Atlantic Treaty Organization (NATO) to the Commonwealth of Nations. Close US-British relations have been an element of Conservative foreign policy since World War II. Winston Churchill during his 1951–1955 post-war premiership built up a strong relationship with the Eisenhower Administration in the United States. Harold Macmillan demonstrated a similarly close relationship with the Democratic administration of John F. Kennedy. Though the US–British relationship in foreign affairs has often been termed a 'Special Relationship', a term coined by Sir Winston Churchill, this has often been observed most clearly where leaders in each country are of a similar political stripe. The former Prime Minister Margaret Thatcher built a close relationship with the American President Ronald Reagan in his opposition to the former Soviet Union, but John Major was less successful in his personal contacts with George H. W. Bush and Bill Clinton. Out of power and perceived as largely irrelevant by American politicians, Conservative leaders Hague, Duncan-Smith, and Howard each struggled to forge personal relationships with presidents Bill Clinton and George W. Bush. However, the Republican 2008 presidential candidate, John McCain, spoke at the 2006 Conservative Party Conference. The Conservatives have proposed a Pan-African Free Trade Area, which it says could help entrepreneurial dynamism of African people. The Conservatives pledged to increase aid spending to 0.7% of national income by 2013. They met this pledge in 2014, when spending on aid reached 0.72% of GDP and the commitment was enshrined in UK law in 2015. David Cameron had sought to distance himself from former US President Bush and his neoconservative foreign policy, calling for a "rebalancing" of US-UK ties and met Barack Obama during his 2008 European tour. Despite traditional links between the centre-right UK Conservatives and US Republicans, and between centre-left Labour and the Democrats, London Mayor Boris Johnson, a Conservative, endorsed Barack Obama in the 2008 election. Beyond relations with the United States, the Commonwealth and the EU, the Conservative Party has generally supported a pro free-trade foreign policy within the mainstream of international affairs. The degree to which Conservative Governments have supported interventionist or non-interventionist presidents in the US has often varied with the personal relations between a US President and the British Prime Minister. Since the terrorist attacks of 11 September 2001, the Conservative Party has supported the coalition military action in Afghanistan. The Conservative Party believes that success in Afghanistan is defined in terms of the Afghans achieving the capability to maintain their own internal and external security. They have repeatedly criticised the former Labour Government for failing to equip British Forces adequately in the earlier days on the campaign—especially highlighting the shortage of helicopters for British Forces resulting from Gordon Brown's £1.4bn cut to the helicopter budget in 2004. The Conservative Party believes that in the 21st century defence and security are interlinked. It has pledged to break away from holding a traditional Strategic Defence Review and have committed to carrying out a more comprehensive Strategic Defence and Security Review (SDSR) immediately upon coming into office. This review will include both defence and homeland security related matters. The Labour Government last conducted a review in 1998. To prevent a long gap in the future it also pledged to hold regular defence reviews every 4–5 years, and if necessary will put this requirement into legislation. Party officials claim that the SDSR will be a major improvement, and will ensure that Britain maintains generic and flexible capability to adapt to any changing threats. It will be a cross-departmental review that will begin with foreign policy priorities and will bring together all the levers of domestic national security policy with overseas interests and defence priorities. As well as an SDSR, the Conservative Party pledged in 2010 to undertake a fundamental and far reaching review of the procurement process and how defence equipment is provided in Britain. It pledged to reform the procurement process, compile a Green Paper on Sovereignty Capability, and publish another Defence Industrial Strategy following on from the Defence Industrial Strategy in 2005. The Conservative Party has said that there will be four aims for British defence procurement: to provide the best possible equipment at the best possible price; to streamline the procurement process to ensure the speedy delivery of equipment to the front line; to support our industry jobs at home by increasing defence exports; to provide defence procurement that underpins strategic relationships abroad and; to provide predictability to the defence industry. The Conservative Party also pledged to increase Britain's share of the global defence market as Government policy. The Conservative Party aims to build enhanced bilateral defence relations with key European partners and believes that it is in Britain's national interest to cooperate fully with all its European neighbours. It has pledged to ensure that any EU military capability must supplement and not supplant British national defence and NATO, and that it is not in the British interest to hand over security to any supranational body. The Conservatives see it as a priority to encourage all members of the European Union to do more in terms of a commitment to European security at home and abroad. Regarding the defence role of the European Union, the Conservatives pledged to re-examine some of Britain's EU Defence commitments to determine their practicality and utility; specifically, to reassess UK participation provisions like Permanent Structured Cooperation, the European Defence Agency and EU Battlegroups to determine if there is any value in Britain's participation. The Conservative Party upholds the view that NATO should remain the most important security alliance for the United Kingdom. It believes that NATO, which has been the cornerstone of British security for the past 60 years, should continue to have primacy on all issues relating to Europe's defence, and pledged in 2010 to make NATO reform a key strategic priority. It has also called on the so-called fighting/funding gap to be changed and have called on the creation of a fairer funding mechanism for NATO's expeditionary operations. As well as this, the Conservatives believe that there is scope for expanding NATO's Article V to include new 21st Century threats such as energy and cyber security. The 2010 manifesto said the Conservatives will maintain Britain's continuous at sea, independent, submarine based strategic nuclear deterrent based on the Trident missile system. In 1945, the Conservatives first declared support for universal healthcare. Since entering office in 2010, they have introduced the Health and Social Care Act, constituting the biggest reformation that the NHS has ever undertaken. However, there has been much criticism and protest about the 2010 government's actions on the NHS, focussing on budget cuts and privatisation of services. After a 2013 union protest said by police to have been one of the largest protests seen in Manchester, the general secretary of the Trades Union Congress (TUC) said that austerity was having a devastating effect, with 21,000 NHS jobs lost over the previous three months alone, and that "The NHS is one of Britain's finest achievements and we will not allow ministers to destroy, through cuts and privatisation, what has taken generations to build." The Department of Health responded that there was "absolutely no government policy to privatise NHS services". Views on drug legality and policing vary greatly within the Conservative Party. Some Conservative politicians such as Alan Duncan take the libertarian approach that individual freedom and economic freedom of industry and trade should be respected. Other Conservative politicians, despite being economically liberal, are in favour of full prohibition of the ownership and trade of many drugs. Other Conservatives are in the middle ground, favouring stances such as looser regulation and decriminalisation of some drugs. Legalisation of cannabis for medical uses is favoured by some Conservative politicians, including Boris Johnson. In education, the Conservatives have pledged to review the National Curriculum, and introduce the English Baccalaureate. The restoration of discipline was also highlighted, as they want it to be easier for pupils to be searched for contraband items, the granting of anonymity to teachers accused by pupils, and the banning of expelled pupils being returned to schools via appeal panels. In Higher education, the Conservatives have increased tuition fees to £9,250 per year, however have ensured that this will not be paid by anyone until they are earning over £25,000. The Scottish Conservatives also support the re-introduction of tuition fees in Scotland. In 2016 the Conservative government extended student loan access in England to postgraduate students to help improve access to education. Within the EU, the UK is one of the largest recipients of research funding in the European Union, receiving £7 billion between 2007 and 2015, which is invested in universities and research-intensive businesses. Following the vote to leave the EU, Prime Minister Theresa May guaranteed that the Conservative government would protect funding for existing research and development projects in the UK. As prime minister, David Cameron wanted to 'support family life in Britain' and put families at the centre of domestic social policy making. He stated in 2014 that there was 'no better place to start' in the Conservative mission of 'building society from the bottom up' than the family, which was responsible for individual welfare and well-being long before the welfare state came into play. He also argued that 'family and politics are inextricably linked'. Both Cameron and Theresa May have aimed at helping families achieve a work-home balance and have previously proposed to offer all parents 12 months parental leave, to be shared by parents as they choose. This policy is now in place, offering 50 weeks total parental leave, of which 37 weeks are paid leave, which can be shared between both parents. Other policies have included doubling the free hours of childcare for working parents of three and four-year-olds from 15 hours to 30 hours a week during term-time. However, numerous childcare providers have argued that this policy is unworkable, as it means that they don't receive enough compensation from the government to make up for the lost childcare fees, and so their businesses are no longer financially viable. The government also introduced a policy to fund 15 hours a week of free education and childcare for 2-year olds in England if parents are receiving certain state benefits or the child has a SEN statement or diagnosis, worth £2,500 a year per child. One of the Conservatives' key policy goals in 2010 was to reduce the number of people in the UK claiming state benefits, and increase the number of people in the workforce. Between 2010 and 2014, all claimants of Incapacity Benefit were moved onto a new benefit scheme, Employment and Support Allowance, which was then subsumed into the Universal Credit system alongside other welfare benefits in 2018. The Universal Credit system has come under immense scrutiny since its introduction. Shortly after her appointment to the Department for Work and Pensions, Secretary of State Amber Rudd acknowledged there were 'real problems' with the Universal Credit system, especially the wait times for initial payments and the housing payments aspect of the combined benefits. Rudd pledged specifically to review and address the uneven impact of Universal Credit implementation on economically disadvantaged women, which had been the subject of numerous reports by the Radio 4 You and Yours programme and others. Until 1999, Conservatives opposed the creation of a national minimum wage, as they believed it would cost jobs, and businesses would be reluctant to start business in the UK from fear of high labour costs. However the party have since pledged support and in the July 2015 budget, Chancellor George Osborne announced a National Living Wage of £9/hour, to be introduced by 2020, for those aged 25 and over. The National Minimum Wage in 2012 was £6.19 for over-21 year olds, so the proposed rises in National Living Wage by 2020 will represent a significantly higher pay for many. However, the National Living Wage varies significantly by age, and there is evidence that up to 200,000 eligible individuals are not actually receiving the pay that they should be under the National Living Wage scheme. The party support, and have implemented, the restoration of the link between pensions and earnings, and seek to raise retirement age from 65 to 67 by 2028. David Cameron brought several 'green' issues to the forefront of his 2010 campaign. These included proposals designed to impose a tax on workplace car parking spaces, a halt to airport growth, a tax on cars with exceptionally poor petrol mileage, and restrictions on car advertising. Many of these policies were implemented in the Coalition—including the 'Green Deal'. In 2010, the Conservatives campaigned with the conviction to cut the perceived bureaucracy of the modern police force and pledged greater legal protection to people convicted of defending themselves against intruders. They also supported the creation of a UK Bill of Rights to replace the Human Rights Act 1998, but this was vetoed by their coalition partners the Liberal Democrats. Some Conservatives, particularly within the socially conservative Cornerstone Group, support the re-introduction of the death penalty. No subject has proved more divisive in the Conservative Party in recent history than the role of the United Kingdom within the European Union. Though the principal architect of the UK's entry into the European Communities (which became the European Union) was Conservative Prime Minister Edward Heath, and both Winston Churchill and Harold Macmillan favoured some form of European union, the bulk of contemporary Conservative opinion is opposed to closer economic and particularly political union with the EU. This is a noticeable shift in British politics, as in the 1960s and 1970s the Conservatives were more pro-Europe than the Labour Party. Divisions on Europe came to the fore under the premiership of Margaret Thatcher (1979–1990) and were cited by several ministers resigning, including Geoffrey Howe, the Deputy Prime Minister, whose resignation triggered the challenge that ended Thatcher's leadership. Under Thatcher's successor, John Major (1990–1997), the slow process of integration within the EU forced party tensions to the surface. A core of Eurosceptic MPs under Major used the small Conservative majority in Parliament to oppose Government policy on the Maastricht Treaty. By doing so they undermined Major's ability to govern. The Conservative Party has members with a varying opinions of the EU, with pro-European Conservatives joining the affiliate Conservative Group for Europe, while some Eurosceptics left the party to join the United Kingdom Independence Party. Under current EU practices, the degree to which a Conservative Government could implement policy change regarding the EU would depend directly on the willingness of other EU member states to agree to such policies. In 2009 the Conservative Party actively campaigned against the Lisbon Treaty, which it believes would give away too much sovereignty to Brussels. Shadow Foreign Secretary William Hague stated that, should the treaty be in force by the time of an incoming Conservative government, he would "not let matters rest there". However, on 14 June 2009 the shadow Business Secretary, Kenneth Clarke, said in an interview to the BBC that the Conservative Party would not reopen negotiations on the Lisbon Treaty if the Irish backed it in a new referendum, which they did on 2 October 2009. The Conservative Party pledged an in-out referendum on membership of the European Union after a renegotiation. The referendum took place on 23 June 2016, and resulted in a vote to leave the European Union—a vote commonly referred to as Brexit. Prime Minister Theresa May signed the notice under Article 50 of the Lisbon Treaty which officially begins Britain's withdrawal from the EU, on 28 March 2017, and at 12:20 on 29 March 2017, the UK ambassador Tim Barrow delivered the notice to EU president Donald Tusk, officially triggering the two-year process of leaving the European Union. The Conservatives staunchly support the maintenance of the United Kingdom, and oppose the independence of any of the countries of the United Kingdom: England, Scotland, Wales or Northern Ireland from it. They have had a mixed history on support for Scottish, Welsh and Northern Irish devolution. In 1968, Edward Heath issued his 'Perth declaration', in support of a Scottish assembly, in the wake of growing nationalism. However, the cause went unanswered during his turbulent premiership, and under Margaret Thatcher and John Major's leadership, the Conservatives vehemently opposed devolution, and campaigned against it in the 1997 devolution referendum. Following the Scottish Parliament's establishment in 1999, they have vowed to support its continued existence, and along with Labour and the Liberal Democrats, they supported the Scotland Bill (2011), granting further devolution of power. They campaigned alongside Labour and the Liberal Democrats against full Scottish Independence in the 2014 Scottish Independence referendum. In Wales, the Conservatives campaigned against devolution in the 1997 referendum, however likewise as with Scotland, they have vowed to maintain the Welsh Assembly's continued existence, and in 2011 supported the further devolution of power. In Northern Ireland, the Conservatives suspended the parliament in 1973 in the wake of the growing Troubles, and made unsuccessful attempts to re-establish it in the same year, and in 1982. They supported the Belfast Agreement negotiated by the Blair government in 1998, and in 2009, negotiated an electoral pact with the declining Ulster Unionist Party, whom it had previously been allied to before 1973 and informally during the John Major's tenure as Prime Minister. The pact was abandoned for the 2015 general election, where the Northern Ireland Conservatives ran their own candidates. On 4 October 2016, the Democratic Unionist Party's leader Arlene Foster and MPs held a champagne reception at the Conservative Party conference, marking what some have described as an "informal coalition" or an "understanding" between the two parties to account for the Conservatives' narrow majority in the House of Commons. Since then, the DUP has generally supported Conservative legislation. The party opposed Labour's attempts to devolve power to the northern regions of England in 2004. It declared support for a commission into the West Lothian Question, as to whether or not only English MPs should be able to vote on issues solely affecting English matters following the Scottish Independence Referendum. Traditionally the Conservative Party have been defenders of Britain's unwritten constitution and system of government. The party opposed many of Tony Blair's reforms, such as the removal of the hereditary peers, the incorporation of the European Convention on Human Rights into British law, and the 2009 creation of the Supreme Court of the United Kingdom, a function formerly carried out by the House of Lords. Until 2001 most members of the party were against an elected House of Lords; however opinion was later split, shown in the vote on the House of Lords Reform Bill 2012, when 80 backbenchers voted for an 80% elected upper chamber, and 110 did not. There was also a split on whether to introduce a British Bill of Rights that would replace the Human Rights Act 1998; David Cameron expressed support, but Ken Clarke described it as "xenophobic and legal nonsense". 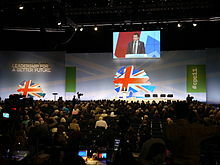 The National Conservative Convention is held during the Conservative Party Conference. The Conservative Party comprises the voluntary party, parliamentary party (sometimes called the political party) and the professional party. Members of the public join the party by becoming part of a local constituency Conservative Association. The country is also divided into regions, with each region containing a number of areas, both having a similar structure to constituency associations. The National Conservative Convention sets the voluntary party's direction. It is composed of all association chairs, officers from areas and regions, and 42 representatives and the Conservative Women's Organisation. The Convention meets twice a year. Its Annual General Meeting is usually held at Spring Forum, with another meeting usually held at the Conservative Party Conference. In the organisation of the Conservative Party, constituency associations dominate selection of local candidates, and some associations have organised open parliamentary primaries. The 1922 Committee consists of backbench MPs, meeting weekly while parliament is sitting. Frontbench MPs have an open invitation to attend. The 1922 Committee plays a crucial role in the selection of party leaders. All Conservative MPs are members of the 1922 Committee by default. There are 20 executive members of the Committee, agreed by consensus among backbench MPs. The Conservative Campaign Headquarters (CCHQ) is effectively head of the Professional Party and leads financing, organisation of elections and drafting of policy. The Conservative Party Board is the party's ultimate decision making body, responsible for all operational matters (including fundraising, membership and candidates) and is made up of representatives from each (voluntary, political and professional) section of the Party. The Party Board meets about once a month and works closely with CCHQ, elected representatives and the voluntary membership mainly through a number of management sub-committees (such as membership, candidates and conferences). Membership peaked in the mid-1950s at approximately 3 million, before declining steadily through the second half of the 20th century. Despite an initial boost shortly after David Cameron's election as leader in December 2005, membership resumed its decline in 2006 to a lower level than when he was elected. In 2010, the Conservative Party had about 177,000 members according to activist Tim Montgomerie, and in 2013 membership was estimated by the party itself at 134,000. The membership fee for the Conservative Party is £25, or £5 if the member is under the age of 23. From April 2013 until the 2015 general election people could join Team2015 without being Party members, and take part in political campaigning for the party. At the 2018 Conservative Spring Forum, Party Chairman Brandon Lewis announced that the party's membership stood at 124,000. Associations select their constituency's candidates. Some associations have organised open parliamentary primaries. A constituency Association must choose a candidate using the rules approved by, and (in England, Wales and Northern Ireland) from a list established by, the Committee on Candidates of the Board of the Conservative Party. Prospective candidates apply to the Conservative Central Office to be included on the approved list of candidates, some candidates will be given the option of applying for any seat they choose, while others may be restricted to certain constituencies. A Conservative MP can only be deselected at a special general meeting of the local Conservative association, which can only be organised if backed by a petition of more than fifty members. From 1998-2015, the Conservative Party maintained a youth wing for members under 30 called Conservative Future, with branches at both universities and at parliamentary constituency level. By 2006, the group had become the largest political organisation on British university campuses. The organisation was closed in 2015 after allegations that bullying by Mark Clarke had caused the suicide of Elliot Johnson, a 21-year-old party activist. On 16 March 2018, at the Conservative Spring Forum, a new organisation called Young Conservatives was launched for Conservative Party members aged under 25. The major annual party events are the Spring Forum and the Conservative Party Conference, which takes place in Autumn in alternately Manchester or Birmingham. This is when the National Conservative Convention holds meetings. In the first decade of the 21st century, half the party's funding came from a cluster of just fifty "donor groups", and a third of it from only fifteen. In the year after the 2010 general election, half the Tories' funding came from the financial sector. For 2013, the Conservative Party had an income of £25.4 million, of which £749,000 came from membership subscriptions. In 2015, according to accounts filed with the Electoral Commission, the party had an income of about £41.8 million and expenditures of about £41 million. Construction businesses, including the Wates Group and JCB, have also been significant donors to the party, contributing £430,000 and £8.1m respectively between 2007 and 2017. The Conservative Party is affiliated to—and plays a leading part in—a number of international organisations. As a global level, the Conservatives are a member of the International Democrat Union, which unites right-of-centre parties, including the Conservative Party of Canada, the U.S. Republican Party, the Liberal Party of Australia, the Indian Bharatiya Janata Party and the Liberty Korea Party. At a European level, the Conservatives are members of the Alliance of Conservatives and Reformists in Europe (ACRE), which unites centre-right parties in opposition to a federal European Union, through which the Conservatives have ties to the Ulster Unionist Party and the governing parties of Israel and Turkey, Likud and the Justice and Development Party respectively. In the European Parliament, the Conservative Party's MEPs sit in the European Conservatives and Reformists (ECR) group, which is affiliated to the ACRE. Party leader David Cameron pushed the foundation of the ECR, which was launched in 2009, along with the Czech Civic Democratic Party and the Polish Law and Justice, before which the Conservative Party's MEPs sat in the European Democrats, which had become a subgroup of the European People's Party in the 1990s. Since the 2014 European election, the ECR group has been the third-largest group, with the largest members being the Conservatives (nineteen MEPs), Law and Justice (eighteen MEPs), the Liberal Conservative Reformers (five MEPs), and the Danish People's Party and New Flemish Alliance (four MEPs each). As of June 2009, Cameron required a further four partners apart from the Polish and Czech supports to qualify for official fraction status in the parliament; the rules state that a caucus needs at least 25 MEPs from at least seven of the 27 EU member states. In forming the caucus, Cameron is reportedly breaking with two decades of co-operation by the UK's Conservative Party with the mainstream European Christian Democrats and conservatives in the European parliament, the European People's Party (EPP) on the grounds that it is dominated by European federalists and supporters of the Lisbon treaty, which is opposed by the Tories. EPP leader Wilfried Martens, former prime minister of Belgium, stated "Cameron's campaign has been to take his party back to the centre in every policy area with one major exception: Europe. […] I can't understand his tactics. Merkel and Sarkozy will never accept his Euroscepticism." The Conservative Party has a variety of internal factions or ideologies, including: One-nation conservatism, Liberal conservatism, Social conservatism, Thatcherism, Traditional conservatism, Neoconservatism, Euroscepticism, Pro-Europeanism, Christian democracy, Localism and Green conservatism. This socially conservative right-wing grouping is currently associated with the Cornerstone Group (or Faith, Family, Flag), and is the oldest tradition within the Conservative Party, closely associated with High Toryism. The name stems from its support for three British social institutions (though the Church is an English institution): the Church of England, the unitary British state and the family. To this end, it emphasises the country's Anglican heritage, oppose any transfer of power away from the United Kingdom—either downwards to the nations and regions or upwards to the European Union—and seek to place greater emphasis on traditional family structures to repair what it sees as a broken society in the UK. It is a strong advocate of marriage and believes the Conservative Party should back the institution with tax breaks and have opposed the alleged assaults on both traditional family structures and fatherhood. Most oppose high levels of immigration and support the lowering of the current 24‑week abortion limit. Some members in the past have expressed support for capital punishment. Prominent MPs from this wing of the party include Andrew Rosindell, Nadine Dorries, Sir Edward Leigh and Jacob Rees-Mogg—the latter two being prominent Roman Catholics, notable in a faction marked out by its support for the established Church of England. The conservative English philosopher Sir Roger Scruton is a representative of the intellectual wing of the traditionalist group: his writings rarely touch on economics and instead focus on conservative perspectives concerning political, social, cultural and moral issues. One-nation conservatism was the party's dominant ideology in the 20th century until the rise of Thatcherism in the 1970s. It has included in its ranks Conservative Prime Ministers such as Stanley Baldwin, Harold Macmillan and Edward Heath. One Nation Conservatives in the contemporary party include Kenneth Clarke, Malcolm Rifkind and Damian Green. The name itself comes from a famous phrase of Disraeli. Ideologically, One Nation Conservatism identifies itself with a broad liberal conservative stance. They are often associated with the Tory Reform Group and the Bow Group. Adherents of One-Nation Conservatism believe in social cohesion and support social institutions that maintain harmony between different interest groups, classes, and—more recently—different races or religions. These institutions have typically included the welfare state, the BBC, and local government. One Nation Conservatives often invoke Edmund Burke and his emphasis on civil society ("little platoons") as the foundations of society, as well as his opposition to radical politics of all types. The Red Tory theory of Phillip Blond is a strand of the One Nation school of thought. Prominent Red Tories include former Cabinet Ministers Iain Duncan Smith and Eric Pickles and Parliamentary Under-Secretary of State Jesse Norman. There is difference of opinion among supporters regarding the European Union. Some support it perhaps stemming from an extension of the cohesion principle to the international level, though others are strongly against the EU (such as Sir Peter Tapsell). The second main grouping in the Conservative Party is the "free-market wing" of economic liberals who achieved dominance after the election of Margaret Thatcher as party leader in 1975. Their goal was to reduce the role of the government in the economy and to this end they supported cuts in direct taxation, the privatisation of nationalised industries and a reduction in the size and scope of the welfare state. Supporters of the "free-market wing" have been labelled as "Thatcherites". The group has disparate views of social policy: Thatcher herself was socially conservative and a practising Anglican but the free-market wing in the Conservative Party harbour a range of social opinions from the civil libertarian views of Michael Portillo, Daniel Hannan, and David Davis to the traditional conservatism of former party leaders William Hague and Iain Duncan Smith. The Thatcherite wing is also associated with the concept of a "classless society". Whilst a number of party members are pro-European, some free-marketeers are Eurosceptic, perceiving most EU regulations as interference in the free market and/or a threat to British sovereignty. EU centralisation also conflicts with the localist ideals that have grown in prominence within the party in recent years. Rare Thatcherite Europhiles included Leon Brittan. Many take inspiration from Thatcher's Bruges speech in 1988, in which she declared that "we have not successfully rolled back the frontiers of the state in Britain only to see them reimposed at a European level". A number of free-market Conservatives have signed the Better Off Out pledge to leave the EU. Thatcherites and economic liberals in the party tend to support Atlanticism, something exhibited between Margaret Thatcher and Ronald Reagan. Thatcher herself claimed philosophical inspiration from the works of Burke and Friedrich Hayek for her defence of liberal economics. Groups associated with this tradition include the No Turning Back Group and Conservative Way Forward, whilst Enoch Powell and Sir Keith Joseph are usually cited as early influences in the movement. Some free-market supporters and Christian democrats within the party tend to advocate the social market economy, which supports free markets alongside social and environmental responsibility, as well a welfare state. Sir Keith Joseph was the first to introduce the model idea into British politics, writing the publication: Why Britain needs a Social Market Economy. Sometimes two groupings have united to oppose the third. Both Thatcherite and Traditionalist Conservatives rebelled over Europe (and in particular Maastricht) during John Major's premiership; and Traditionalist and One Nation MPs united to inflict Margaret Thatcher's only major defeat in Parliament, over Sunday trading. Not all Conservative MPs can be easily placed within one of the above groupings. For example, John Major was the ostensibly "Thatcherite" candidate during the 1990 leadership election, but he consistently promoted One-Nation Conservatives to the higher reaches of his cabinet during his time as Prime Minister. These included Kenneth Clarke as Chancellor of the Exchequer and Michael Heseltine as Deputy Prime Minister. The Voter Communications Department is line-managed by the Conservative Director of Communications who upholds overall responsibility, though she has many staff supporting her, and the whole of CCHQ at election time, her department being one of the most predominant at this time, including Project Managers, Executive Assistants, Politicians, and Volunteers. The Conservative Party also has regional call centres and VoteSource do-it-from-home accounts. This chart shows the electoral performance of the Conservative Party in each general election since 1835. For results of the Tories, the party's predecessor, see here. ^ The first election held under the Reform Act 1867. ^ The first election held under the Representation of the People Act 1884 and the Redistribution of Seats Act 1885. ^ "Young Conservatives Relaunch". Guido Fawkes. 16 March 2018. Retrieved 3 May 2018. ^ Audickas; Dempsey; Keen. "Membership of UK political parties". Parliament.uk. Retrieved 5 May 2018. ^ "Capping welfare and working to control immigration". Conservative and Unionist Party. Archived from the original on 9 June 2016. Retrieved 1 July 2016. ^ a b Nordsieck, Wolfram (2017). "United Kingdom". Parties and Elections in Europe. Retrieved 3 May 2018. ^ Whiteley, Paul; Seyd, Patrick; Richardson, Jeremy (1994). True Blues: The Politics of Conservative Party Membership. Oxford University Press. pp. 141–142. ISBN 978-0-19-154441-5. Retrieved 9 May 2016. ^ Lynch, Philip; Whitaker, Richard; Loomes, Gemma. "Competing on the centre right: An examination of party strategy in Britain". University of Leicester. Retrieved 9 May 2016. ^ Coulson, Rebecca (4 May 2016). "What does being right wing mean?". Conservative Home. Retrieved 9 May 2016. ^ "Lords by party, type of peerage and gender". Parliament.uk. Retrieved 13 June 2015. ^ a b "Local Council Political Compositions". Open Council Date UK. 23 January 2018. Archived from the original on 30 September 2017. Retrieved 23 September 2018. ^ "Profile: The Conservative Party". BBC News. 25 March 2010. Retrieved 3 May 2017. ^ Steve Coulter (10 April 2011). "Book Review: The Conservative Party from Thatcher to Cameron". Retrieved 8 July 2016. ^ Philip Johnston (19 April 2016). "The Conservative Party may be destroyed by this European madness". The Daily Telegraph. Retrieved 8 July 2016. ^ Andrew Gimson (15 May 2017). "Why the Tories keep winning". New Statesman. Retrieved 18 October 2017. ^ Safire, William (2008). Safire's Political Dictionary. Oxford University Press. p. 144. ISBN 978-0195343342. Retrieved 29 March 2017. ^ Peter Fraser, "Unionism and Tariff Reform: The Crisis of 1906." Historical Journal 5.2 (1962): 149-166. ^ Andrew Roberts, Churchill: Walking with Destiny (2018) p 92. ^ Neal Blewett, Peers, the Parties and the People: General Election of 1910 (1972). ^ Graham D. Goodlad, "The 'Crisis' of Edwardian Conservatism," Modern History Review (1998) 9#4 pp 10-13. ^ Jeremy Smith, "Bluff, Bluster and Brinkmanship: Andrew Bonar Law and the Third Home Rule Bill." Historical Journal 36#1 (1993): 161-178. ^ Keohane, Nigel (2010). The Party of Patriotism: The Conservative Party and the First World War. Ashgate. ^ Jarvis, David (1992). "Mrs. Maggs and Betty: The Conservative Appeal to Women Voters in the 1920s". Twentieth Century British History. 5 (2): 129–52. doi:10.1093/tcbh/5.2.129. ^ a b Bogdanor, Vernon (1983). Multi-Party Politics and the Constitution. Cambridge University Press. ^ Zweiniger-Bargileowska, Ina. "Rationing, austerity and the Conservative party recovery after 1945." Historical Journal (1994) 37#1 pp. 173–97. ^ Kynaston, David (2007). Austerity Britain: 1945–1951. London: Bloomsbury. pp. 238–41. ISBN 978-0-7475-7985-4. ^ Blake, Robert. The Conservative Party from Peel to Major (1997) pp. 260–64. ^ Toye, Richard. "From 'Consensus' to 'Common Ground': The Rhetoric of the Postwar Settlement and its Collapse," Journal of Contemporary History (2013) 48#1 pp. 3–23. ^ The Economist, 'Mr Butskell's Dilemma', 13 February 1954. ^ Morgan, Kenneth O. (2001). Britain Since 1945: The People's Peace: The People's Peace. Oxford UP. pp. 114–15. ISBN 9780191587993. ^ Kynaston, David (2013). Modernity Britain: Opening the Box 1957–1959. London: Bloomsbury. p. 158. ISBN 978-0-7475-8893-1. ^ Thorpe, D.R. (2010). Supermac. ^ "History of Sir Alec Douglas". Inside Government. Retrieved 18 June 2013. ^ "On This Day 1965: Heath is new Tory leader". BBC News. 27 July 1996. Retrieved 18 June 2013. ^ "1970: Heath's surprise victory". BBC News. 5 April 2005. Retrieved 1 April 2010. ^ "1974 Oct : Wilson makes it four". BBC News. 5 April 2005. Retrieved 1 April 2010. ^ "1979: Thatcher wins Tory landslide". BBC News. 5 April 2005. Retrieved 1 April 2010. ^ David Butler and Dennis Kavanagh, "The British General Election of 1979", Macmillan, 1979, p. 154. ^ David Dutton, British Politics Since 1945: The Rise, Fall and Rebirth of Consensus (2nd ed. Blackwell, 1997). ^ Aled Davies, "'Right to Buy': The Development of a Conservative Housing Policy, 1945–1980." Contemporary British History 27.4 (2013): 421–44. ^ a b "1983: Thatcher triumphs again". BBC News. 5 April 2005. Retrieved 1 April 2010. ^ Stephanie Flanders. "Were 364 economists all wrong?". BBC News. Retrieved 13 January 2015. ^ Office for National Statistics (13 January 2015). "Consumer Price Indices – RPI annual percentage change: 1948 to 2014". UK Government. Retrieved 13 January 2015. ^ "North Sea oil: Facts and figures". BBC News. 24 February 2014. Retrieved 13 January 2015. ^ a b c d e f g "Poll tracker: Interactive guide to the opinion polls". BBC News. 29 September 2009. Retrieved 1 April 2010. ^ "1987: Thatcher's third victory". BBC News. 5 April 2005. Retrieved 1 April 2010. ^ "On This Day 1990: Thatcher quits as prime minister". BBC News. 22 November 1990. Retrieved 1 April 2010. ^ "1992: Tories win again against odds". BBC News. 5 April 2005. Retrieved 1 April 2010. ^ "1993: Recession over – it's official". BBC News. 26 April 1993. Retrieved 1 April 2010. ^ Swaine, Jon (1 December 2008). "Train fares cost more than under British Rail". Daily Telegraph. Retrieved 7 July 2015. ^ Cowling, David (9 February 2001). "Poll monitor: Labour looks hard to beat". BBC News. Retrieved 20 April 2007. ^ "Trying to be 'down with the kids'". BBC News. 7 March 2003. Retrieved 20 April 2007. ^ "Tory critics round on Hague". BBC News. 5 March 2001. Retrieved 20 April 2007. ^ "Tory peer attacks Hague over race". BBC News. 27 April 2001. Retrieved 20 April 2007. ^ "2005 General election results summary". UK Political Info. Retrieved 30 January 2012. ^ "Full text of David Cameron's victory speech". The Guardian. London. 12 June 2005. Retrieved 20 April 2007. ^ Wheeler, Brian (3 July 2009). "Minister in Tory homophobia claim". BBC News. Retrieved 7 July 2009. ^ "Conservative or Labour preference ("forced choice")". UK Polling Report. YouGov. Retrieved 20 April 2007. ^ "Labour at its lowest ebb". The Sun. London. 9 May 2008. Archived from the original on 13 May 2008. Retrieved 10 May 2008. ^ "Boris is the new Mayor of London". Conservative Party. 3 May 2008. Archived from the original on 6 May 2008. ^ "Election 2010 results". BBC News. Retrieved 12 May 2010. ^ "European voters now calling for less EU". The UK News. Archived from the original on 28 May 2014. Retrieved 27 May 2014. ^ Holehouse, Rosa Prince Matthew (8 May 2015). "Election 2015: Ed Miliband resigns as Conservatives win stunning majority". Daily Telegraph. Retrieved 8 May 2015. ^ "Election results: Conservatives win majority". BBC News. 8 May 2015. Retrieved 8 May 2015. ^ Parker, George (8 May 2015). "It is 1992 all over again for David Cameron's Conservatives". Financial Times. Nikkei. Retrieved 31 May 2016. ^ Elgot, Jessica; Mason, Rowena (16 March 2017). "Conservatives fined record £70,000 for campaign spending failures". The Guardian. Retrieved 4 April 2017. ^ "Theresa May gains strong support from Conservative MPs". Itv.com. 30 June 2016. Retrieved 20 August 2016. ^ "Theresa May v Andrea Leadsom to be next prime minister". BBC News. 8 July 2016. Retrieved 20 August 2016. ^ correspondent, Rowena Mason Political (11 July 2016). "May promises social reform in centrist leadership pitch". The Guardian. ^ "Theresa May: Word unionist 'very important to me'". BBC News. BBC. 13 July 2016. Retrieved 14 July 2016. ^ Quinn, Ben (30 June 2016). "Theresa May sets out 'one-nation Conservative' pitch for leadership". The Guardian. ^ editor, Heather Stewart Political (13 July 2016). "Theresa May appeals to centre ground but cabinet tilts to the right". The Guardian. ^ "Who is David Davis? A profile of Britain's new 'Brexit Secretary'". The Telegraph. 31 January 2018. ^ Gross, Jenny; Douglas, Jason (13 July 2016). "U.K.'s Theresa May Readies Brexit Team With Boris Johnson in Key Cabinet Post". Wall Street Journal. ^ Walker, Peter (14 July 2016). "Women get key jobs as Theresa May sacks four senior ministers". The Telegraph. London, UK. Retrieved 14 July 2016. ^ Walker, Peter (14 July 2016). "Theresa May appoints Justine Greening and Liz Truss after mass cull of old government sees Michael Gove and Nicky Morgan axed". The Telegraph. London, UK. Retrieved 14 July 2016. ^ "Andrea Leadsom appointed environment secretary". The Guardian. London, UK. 14 July 2016. Retrieved 14 July 2016. ^ "Theresa Villiers to be replaced as Northern Ireland secretary". BBC News. BBC. 14 July 2016. Retrieved 14 July 2016. ^ Swinford, Steven (12 July 2016). "Women to make up nearly half of Theresa May's reshuffled Cabinet". The Telegraph. ^ Stewart, Heather (14 July 2016). "Theresa May appeals to centre ground but cabinet tilts to the right". The Guardian. London, UK. Retrieved 14 July 2016. ^ "Theresa May seeks general election". YouTube. 18 April 2017. ^ "Who are the DUP and will they demand a soft Brexit to prop up the Tories?". The Daily Telegraph. Retrieved 9 June 2017. ^ "General Election 2017 result live: We will work with DUP friends and allies in interests of all UK, says Theresa May". Belfast Telegraph. 9 June 2017. Retrieved 9 June 2017. ^ "DUP and Conservatives make confidence and supply deal worth £1.5bn". Sky News. Retrieved 21 April 2018. ^ "Cabinet meets as reshuffle continues". BBC News. 2018. Retrieved 9 January 2018. ^ "Three Conservative MPs to defect to Independent Group". The Guardian. 20 February 2019. Retrieved 20 February 2019. ^ "Three Tory MPs join Labour breakaway group". BBC News. 20 February 2019. Retrieved 20 February 2019. ^ a b c "Baroness Warsi: Conservatives must act on Islamophobia". BBC News. 31 May 2018. Retrieved 9 June 2018. ^ "Conservatives under fire for failing to tackle party's Islamophobia". The Guardian. 31 May 2018. Retrieved 9 June 2018. ^ Bienkov, Adam (11 June 2018). "The Islamophobia scandal in the Conservative party goes 'right up to the top'". Business Insider. Retrieved 9 June 2018. ^ Kentish, Benjamin (12 June 2018). "Islamophobia 'very widespread' in Conservative Party, says Baroness Warsi". The Independent. Retrieved 12 June 2018. ^ "Tories have not tackled Islamophobia, Conservative Muslim Forum saysa". BBC News. 6 June 2018. Retrieved 9 June 2018. ^ Khan, Shehab (4 June 2018). "More than 350 mosques urge Conservatives to launch internal inquiry into Islamophobia claims". The Independent. Retrieved 12 June 2018. ^ Sabbagh, Dan (4 July 2018). "Sayeeda Warsi calls for inquiry into Islamophobia within Tory party". The Guardian. Retrieved 4 July 2018. ^ "Johnson burka 'letter box' jibe sparks anger". BBC News. 6 August 2018. ^ "Tory London mayoral candidate claimed celebrating Hindu and Muslim festivals has turned Britain into 'cesspool of crime'". 3 October 2018. ^ "The death and life of Britain's market economy". Financial Times. 24 January 2014. ^ Letwin, Oliver (1 October 2017). "The case for social market capitalism must be made once again, says Sir Oliver Letwin". Express. ^ "Business: The Economy – Labour's economic record". BBC News. 26 July 1999. Retrieved 20 April 2007. ^ "Portillo springs surprise U-turns". BBC News. 3 February 2000. Retrieved 20 April 2007. ^ "Budget 2012: Top tax rate cut from 50p to 45p". Bbc.co.uk. 21 March 2012. Retrieved 1 July 2016. ^ Hayton, Richard; McEnhill, Libby (20 April 2015). "Cameron's Conservative Party, social liberalism and social justice". British Politics. 10 (2): 131–147. doi:10.1057/bp.2015.19. ISSN 1746-918X. ^ "Biography – Rt Hon Alan Duncan MP". Alan Duncan. 27 May 2012. Retrieved 18 June 2013. ^ Spencer, Clare (October 2011). "Daily View: Liam Fox's fate". BBC blog. Retrieved 18 June 2013. ^ "Owen Paterson is ConHome readers' One To Watch in 2013 The Tory Diary". Conservative home. 30 December 2012. Retrieved 18 June 2013. ^ Montgomerie, Tim (November 2012). "Underrated: Owen Paterson". Stand Point. Retrieved 18 June 2013. ^ Payne, Sebastian (16 December 2017). "'Where next for the Conservatives?'". The Financial Times. ^ "Mr Iain Duncan Smith - Contributions - Hansard". hansard.parliament.uk. Retrieved 30 November 2018. ^ Sparrow, Andrew (26 February 2008). "Cameron attacks 'state multiculturalism'". The Guardian. London. Retrieved 1 April 2010. ^ a b "Tory warning on multiculturalism". BBC News. 28 September 2008. Retrieved 1 April 2010. ^ Kylie Maclellan (25 February 2016). "As EU vote looms, immigration rise piles pressure on Cameron". reuters.com. ^ William James (27 August 2015). "UK immigration hits record high, causing headache for Cameron". reuters.com. ^ Grice, Andrew (26 February 2015). "David Cameron immigration pledge 'failed spectacularly' as figures show net migration almost three times as high as Tories promised". The Independent. London. ^ Kingsley, Patrick (10 August 2015). "10 truths about Europe's migrant crisis". the Guardian. Retrieved 30 November 2018. ^ "FactCheck: Are migrants causing the A&E crisis?". Channel 4 News. Retrieved 30 November 2018. ^ Kettle, Martin (29 August 2006). "David Cameron's special relationship". The Guardian. London. Retrieved 20 April 2007. ^ a b Robbins, James (26 June 2008). "Cameron's Britain: Foreign policy". BBC. Retrieved 1 June 2009. ^ Anderson, Mark (9 March 2015). "UK passes bill to honour pledge of 0.7% foreign aid target". The Guardian. Retrieved 13 July 2015. ^ Tempest, Matthew (11 September 2006). "Cameron: I'm no neo-con". The Guardian. London. Retrieved 20 April 2007. ^ Fox, Liam (28 September 2009). "If Afghanistan will be lost, it will be lost at home". Conservative Party. Archived from the original on 22 June 2011. Retrieved 28 September 2009. ^ Fox, Liam (15 December 2009). "Armed Forces pay for Labour's incompetence". Conservative Party. Archived from the original on 13 January 2010. ^ "The Strategic Defence and Security Review: A Conservative View of Defence and Future Challenges". Royal United Services Institute. 8 February 2010. Archived from the original on 22 June 2011. Retrieved 8 February 2010. ^ a b Fox, Liam (11 February 2010). "The EU should only act when NATO cannot". Archived from the original on 1 April 2010. Retrieved 4 March 2010. ^ "Liam Fox: The EU should only act when NATO cannot". Conservative Party. 11 February 2010. Archived from the original on 1 April 2010. Retrieved 20 April 2007. ^ British Conservative Party election manifesto, 1945 [Archive]. Politicsresources.net (22 October 2012). ^ "50,000 march in NHS cuts protest in Manchester". BBC News. 29 September 2013. ^ Johnson, Boris (24 April 2008). "Legalise cannabis for pain relief". The Daily Telegraph (London). ^ "Subscribe to read". FT.com. Retrieved 4 April 2017. ^ "How much research funding does the UK get from the EU and how does this compare with other countries?". RoyalSociety.org. Retrieved 4 April 2017. ^ Cressey, Daniel (2016). "UK government gives Brexit science funding guarantee". Nature.com. doi:10.1038/nature.2016.20434. Retrieved 4 April 2017. ^ a b c "David Cameron on families". GOV.UK. Retrieved 30 November 2018. ^ Summers, Deborah (15 March 2008). "Family at heart of Conservative policy, says Cameron". The Guardian. Retrieved 4 April 2017. ^ "Shared Parental Leave and Pay". GOV.UK. Retrieved 30 November 2018. ^ Ferguson, Donna (26 August 2017). "Looking forward to those 30 hours of free nursery care? Think again …". the Guardian. Retrieved 30 November 2018. ^ Swinford, Steven (8 May 2015). "Conservative manifesto 2015: summary of key policies". Telegraph.co.uk. Retrieved 4 April 2017. ^ "Help paying for childcare". GOV.UK. Retrieved 30 November 2018. ^ "Incapacity Benefit". GOV.UK. Retrieved 30 November 2018. ^ "Universal Credit for sick and disabled people". Retrieved 30 November 2018. ^ a b "Universal Credit: Amber Rudd acknowledges 'real problems' with welfare system". Sky News. Retrieved 30 November 2018. ^ "BBC Radio 4 - You and Yours, Universal Credit and electric planes". BBC. Retrieved 30 November 2018. ^ Is the National Minimum Wage Safe Under a Conservative Government Poll? Archived 11 January 2012 at the Wayback Machine. General-election-2010.co.uk (5 May 2011). ^ "Budget 2015: Osborne commits to national living wage". BBC News. 8 July 2015. Retrieved 8 July 2015. ^ "National Minimum Wage and National Living Wage rates". GOV.UK. Retrieved 30 November 2018. ^ "Workers underpaid by record £15.6m". BBC News. 22 September 2018. Retrieved 30 November 2018. ^ "Changes to State Pension Age | Age UK". www.ageuk.org.uk. Retrieved 30 November 2018. ^ "David Cameron pledges radical green shake-up". The Daily Telegraph. 14 September 2007. ^ Mardell, Mark (26 June 2008). "Cameron's Britain: Euro-doubts". BBC News. Retrieved 1 April 2010. ^ "Clarke's treaty pledge sparks row". BBC News. 14 June 2009. Retrieved 14 June 2009. ^ Manley, John (14 October 2016). "NI Conservatives' disquiet over DUP love-in to be raised with party HQ". The Irish News. ^ Gibbon, Gary (4 October 2016). "Tories look to increase majority with DUP deal". Channel 4. ^ "Divisions – 2015–present, Westminster". The Public Whip. Retrieved 28 March 2017. ^ "Blair attacks hereditary peers". BBC News. 18 November 1998. Retrieved 18 June 2013. ^ "80 Tory backbenchers voted for Lords reform last night. 110 did not. Tory MPs". Conservative home. 11 July 2012. Retrieved 18 June 2013. ^ "Clarke slams Cameron rights plan". BBC News. 27 June 2006. Retrieved 18 June 2013. ^ a b "Party Structure and Organisation". Conservative Party. Retrieved 16 November 2016. ^ Rallings, Colin; Thrasher, Michael (2007). British electoral facts, 1832–2006 (7th ed.). Table 2.01 "Summary Results of General Elections 1832–2005 (UK)", p. 59. ISBN 978-0-7546-2712-8. ^ "Election 2010 Results". BBC News. ^ McGuinness, Feargal (3 December 2012). "Membership of UK political parties" (PDF). House of Commons Library. Retrieved 21 April 2014. ^ "Conservative membership has nearly halved under Cameron". BBC News. 18 September 2013. Retrieved 21 April 2014. ^ Yorke, Harry (17 March 2018). "Conservative Party nearly twice the size originally thought, new figures show". The Telegraph. ISSN 0307-1235. Retrieved 19 March 2018. ^ Knight, Julian (2015). British Politics For Dummies (2nd ed.). p. 202. ISBN 978-1-118-97152-9. ^ a b Colomer, Josep M. (2013). Personal Representation: The Neglected Dimension of Electoral Systems. European Consortium for Political Research. p. 45. ISBN 9781907301575. ^ Webber, Esther (2 August 2013). "The costly process of becoming an election candidate". BBC News. ^ Gordon, Bryony (3 October 2006). "Forget Tory Boy, Conservatives are now cool". ISSN 0307-1235. Retrieved 19 March 2018. ^ "Young Conservatives Relaunch - Guido Fawkes". Guido Fawkes. 16 March 2018. Retrieved 19 March 2018. ^ "Young Conservatives (@young_tories) | Twitter". twitter.com. Retrieved 19 March 2018. ^ Crone, Stephen; Wilks-Heeg, Stuart (20 December 2010). "Just 50 'donor groups' have supplied over half of the Conservative party's declared donation income in the last decade, a fact disguised by legal 'fame avoidance' techniques". British Politics and Policy blog at LSE. Archived from the original on 12 July 2013. Retrieved 10 July 2013. ^ Syal, Rajeev; Treanor, Jill; Mathiason, Nick (30 September 2011). "City's influence over Conservatives laid bare by research into donations". The Guardian. London. Retrieved 10 July 2013. ^ "Labour was best-funded UK political party in 2013". BBC News. 29 July 2014. ^ "Details of party accounts since 2002". Electoral Commission. Retrieved 15 July 2017. ^ "Tories boosted by construction donations". The Construction Index. 25 August 2017. Retrieved 25 August 2017. ^ a b c Traynor, Ian (2 June 2009). "Anti-gay, climate change deniers: meet David Cameron's new friends". The Guardian. London. Retrieved 2 June 2009. ^ "UK Politics – Cameron: Tories need new identity". bbc.co.uk. ^ "Introducing Cameronism". BBC News. 11 July 2011. Retrieved 2 June 2012. ^ "Why liberal conservatism isn't dead". Coffee House. 20 February 2013. ^ "Document 783" (PDF). GEES. Archived from the original (PDF) on 16 October 2013. Retrieved 18 June 2013. ^ Richard Seymour (3 March 2011). "The siren song of the neocons in David Cameron's cabinet". the Guardian. ^ a b Lynch, Whitaker, Philip, Richard (2012). "Where There is Discord, Can They Bring Harmony? Managing Intra-party Dissent on European Integration in the Conservative Party" (PDF). The British Journal of Politics and International Relations. Archived from the original (PDF) on 2 May 2014. Retrieved 1 May 2014. ^ Stanley, Tim (5 October 2016). "Theresa May has closed the liberal era. Bring on Christian democracy". The Telegraph. ^ Garner, Robert; Kelly, Richard N. (1998). British political parties today. p. 66. ^ "Despite Appearances Conservatism Remains the Dominant Ideology". The American Conservative. 13 January 2012. Retrieved 7 November 2012. ^ Bale, Tim (2011). The Conservative Party: From Thatcher to Cameron. p. 145. ^ "Supporters". Better Off Out. Archived from the original on 20 June 2013. Retrieved 18 June 2013. ^ Evans, Eric J. (2004). Thatcher and Thatcherism. pp. 6, 72. ^ "Mr Major's Third Cabinet". John Major. 25 September 1992. Retrieved 18 June 2013. ^ a b "Party Structure and Organisation". Conservatives.com. Retrieved 21 June 2018. ^ "Philip May's Calling Community". Conservatives.com. Retrieved 21 June 2018. ^ "w4mp - The site for everyone working for an MP". W4mpjobs.org. Retrieved 21 June 2018. ^ "General Election Results 1885–1979". Election.demon.co.uk. Retrieved 13 April 2010. Bale, Tim (2011). The Conservative Party: From Thatcher to Cameron. Cambridge, England: Polity Press. ISBN 978-0-7456-4858-3. Blake, Robert (2011). The Conservative Party from Peel to Major (4th ed.). London: Faber Finds. Evans, Eric J. (2004). Thatcher and Thatcherism. Paterson, David (2001). Liberalism and Conservatism, 1846–1905. Ball, Stuart. Portrait of a Party: The Conservative Party in Britain 1918-1945 (Oxford UP, 2013). Charmley, John. "Tories and Conservatives." in David Brown, Robert Crowcroft, and Gordon Pentland eds., The Oxford Handbook of Modern British Political History, 1800-2000 (2018): 306. ——— . British conservatism: the politics and philosophy of inequality (IB Tauris, 2010), Covers more than just political party. Ensor, R. C. K. England, 1870-1914 online], passim. Hayton, Richard, and Andrew Scott Crines, eds. Conservative orators from Baldwin to Cameron (2015). Roberts, Andrew. Churchill: Walking with Destiny (2018), a fully detailed biography. Thackeray, David. "Home and Politics: Women and Conservative Activism in Early Twentieth‐Century Britain," Journal of British Studies (2010) 49#4 pp. 826–48. Crowson, N. J., ed. The Longman Companion to the Conservative Party Since 1830 (2001); chronologies; relations with women, minorities, trade unions, EU, Ireland, social reform and empire. Harrison, Brian. "Margaret Thatcher's Impact on Historical Writing", in William Roger Louis, ed., Irrepressible Adventures with Britannia: Personalities, Politics, and Culture in Britain (London, 2013), 307–21. Porter, Bernard. "'Though Not an Historian Myself…'Margaret Thatcher and the Historians." Twentieth Century British History 5#2 (1994): 246–56. Turner, John. "The British Conservative Party in the Twentieth Century: from Beginning to End?." Contemporary European History 8#2 (1999): 275–87. Wikimedia Commons has media related to Conservative Party (UK).